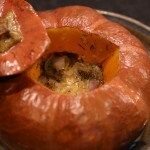 Squash is one of my most treasured fall foods. It is comfort food: the culinary equivalent of a cozy sweater on a cool day. My favourite way to prepare it is baked with or without a stuffing. 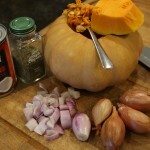 But I love it as a soup, sauteed with onions, grilled with herbs, mixed into chili, chopped up and baked with other veggies, mashed with butter… ok, so I just LOVE squash. 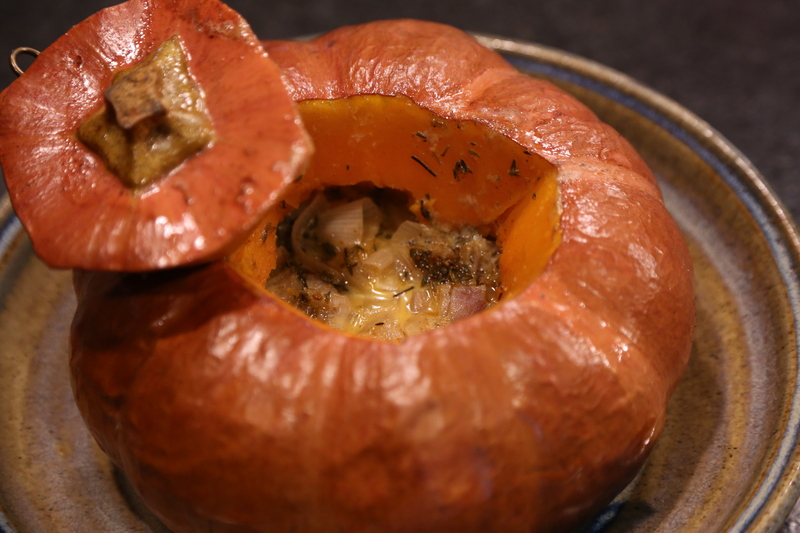 This squash is a cross between pumpkin and butternut. Its round, lobed, squat shape is very much pumpkin, but the flesh is dense like butternut. The skin harks more to the butternut parentage also. The skin turned a nice rusty orange colour when I baked it. When stuffed with chopped shallots, a dash of salt, some thyme and enough coconut milk to fill the cavity nearly full, I baked it in our Big Green Egg. You could of course bake it in the oven. The “Egg” is nice because it adds some smokiness to the flavour. I filled the cavity loosely with shallots then added the other ingredients. You could change it up and use mushrooms and cream, walnuts and sage with butter, the possible variations are endless! The squash is done when the coconut milk boils and is overflowing the sides and the flesh is soft to the touch (around an hour and a half at 350F in the oven). Coconut milk running down the sides makes the skin extra delicious! I like eating the skin anyway, but some people need a little encouragement. My family and I enjoyed this with friends and it accompanied a rice dish from another blog post, but it could easily replace the potatoes, pasta or rice for any dinner. Next time, I’m going to try cutting the squash into crescents by following it’s lobes and baking it with some butter, garlic and thyme. Or maybe I’ll put it on the pizza stone in the “egg”… Cooking is creating!